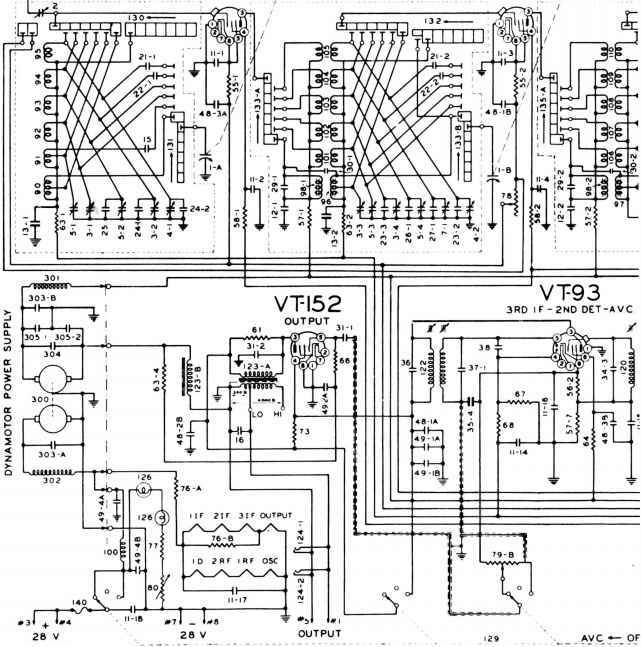 To get an overall view of a typical superheterodyne receiver, examine the complete schematic diagram on page 38. Two special purpose tubes are used. The pentagrid converter functions as local oscillator and mixer. The variable tuned circuits are ganged for oscillator tracking. Trimmer capacitors CI and C2 and padder capacitor C3 are included to help in tracking. They are screwdriver adjustable. R1 provides about 3 volts grid leak bias for the local oscillator. IF transformer T2 selects the IF frequency and applies it to the grid of the IF amplifier. The second special purpose tube, a 6SQ7, serves as a detector, an AF voltage amplifier, and an AVC rectifier. The detector filter is formed by load resistors R5 and R6 and RF bypass capacitors C13 and C14. C15 and R7 make up the RC circuit that supplies the audio voltage to the grid of the first AF amplifier. The volume control system includes MVC and AVC. MVC is made possible by potentiometer R6. Filters formed by C6-R2 and C8-R4 eliminate modulation from the AVC voltage fed back to the grids of the converter and IF amplifier. The power supply uses a full wave rectifier tube, with a capacitor input filter composed of L, C19, and C18, an arrangement used in most AC operated receivers. R12 and R13 form a voltage divider and bleeder circuit. Screen voltages for the converter and IF amplifier are taken from this divider. Capacitor CIO keeps the screens of both tubes at RF ground potential. Note the plate and screen voltages applied to the power amplifier. B+ is applied directly to the screen but has to go through transformer T4 to reach the plate. Because of the voltage drop across the plate transformer, the screen voltage is slightly higher than the plate voltage. The AF output of the 1st AF amplifier is capacitively coupled to the power amplifier. The value of the coupling capacitor C16 and resistor RIO are such that they pass the lowest desired audio frequency. Rll provides bias for the power amplifier. Note that Rll is not bypassed by a capacitor. Thus there is degenerative feedback, providing greater fidelity.